FIRST in the THOMAS KINKADE Ornament Series. 1997. California artist Thomas Kinkade is one of today's most collected contemporary artists. A modern day impressionist, he infuses light into his painting, evoking nostalgia, peace, & tranquility. 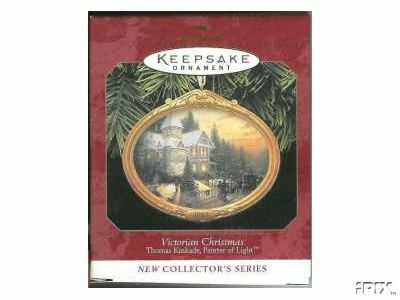 ... For this charming portrayal of a stately old Victorian house in his hometown, Kinkade has turned the clock back to a Christmas Eve around the turn of the century. 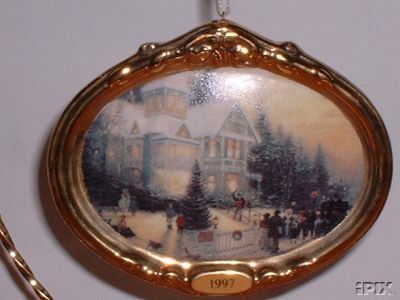 Items Similar To "THOMAS KINKADE: Victorian Christmas Hallmark PORCELAIN 1997 Ornam..."